FORT WAYNE — For a third consecutive season, the Indianapolis Colts will visit Parkview Field for a TinCaps game, as part of the team’s traveling marketing campaign, ”Colts At Bat,” featuring players and cheerleaders. Colts Prow Bowl wide receiver T.Y. 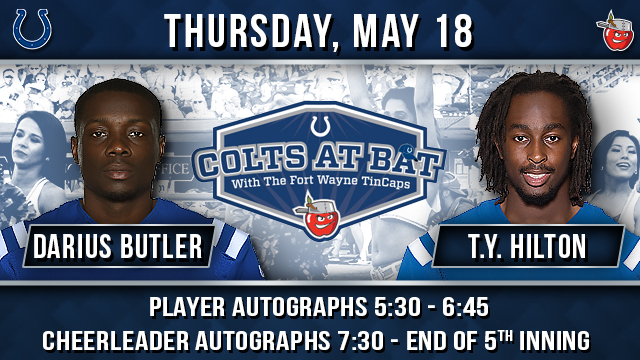 Hilton, defensive back Darius Butler, and cheerleaders will be signing autographs at Parkview Field on Thursday, May 18, when the TinCaps host the Great Lakes Loons (Los Angeles Dodgers) for a 7:05 p.m. game. The Colts will provide several elements for fans attending the game, including player autographs prior to the first pitch (5:30-6:45), cheerleader performances and autographs (7:30-end of the 5th inning), Colts Mascot Blue, free Colts giveaways, and Colts In Motion, the team’s traveling museum. Fans may also sign up for one of the Colts Official Fan Clubs and register to win Colts tickets. Fans must purchase a ticket to the baseball game in order to participate in the “Colts at Bat” activities. Visit colts.com/events for more details. May 18 is also a Thirsty Thursday™, presented by Rudy’s featuring Postgame Fireworks, presented by Meijer. Tickets are available at TinCapsTickets.com and the Parkview Field Ticket Office, or by calling 260-482-6400. Hilton led the NFL in receiving yards in 2016 with 1,448 and was named to his third consecutive Pro Bowl. He’s going into his sixth season with Indianapolis after he was drafted out of FIU in 2012. Butler, who’s led the Colts in interceptions over the last five seasons, has been in Indianapolis since 2012 as well. He was originally a second-round pick of the Patriots in 2009 and played two seasons for New England, before spending 2011 with the Carolina Panthers. Special Notes: The Colts encourage all fans to arrive early at Parkview Field. The line for player and cheerleader autographs may be cut off at any time to ensure the tour remains on schedule. Inclement weather or traffic may cause for late arrival or early departure. All Summer Tour events will take place rain or shine. Fans will be allowed one autograph person; however, fans may get back in line for additional autographs. All Colts event times are local.